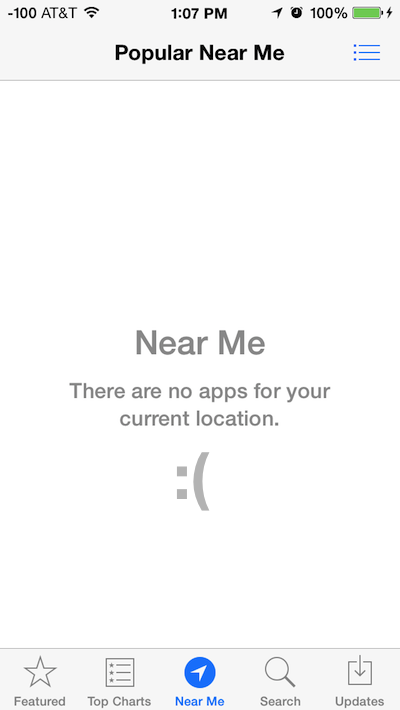 The App Store gained a location awareness feature in iOS 7 that lists the most popular applications used in any given region, based upon the devices current location. For iPhone users who live in a particular location, it may not be that exciting beyond a one-time check up – though some cities do have great local apps that can be found and resurfaced through the ‘Popular Near Me’ menu – the feature really shines for travelers when visiting a new city or region. It’s a mainstay feature in the App Store, but if your primary App Store function is just updating apps and seeing what’s on the top charts, you may have missed it. This can be a great way to discover apps you’d never had found otherwise when on the road. First, you may see nothing due to having turned off location services, or having prevented location access to the App Store at some point. In such a case, you’ll need to toggle it back on again to gain the feature – remember you can quickly launch settings by asking Siri, location included. Or second, you may see nothing because there just isn’t enough activity in the region. This is less common, but for smaller towns, passthroughs, and rural areas, you often will get a blank page without any recommendations. In some respects this makes this best for city users, kind of like the walking directions in the native Apple Maps app, where Apple has plenty of user data to pull from, and folks living in smaller communities may be out of luck, for the time being at least. Technically this feature works for all iOS devices, but it’s really most useful on the iPhone with it’s always-on cellular data and GPS functionality. This always turns up blank for me, and I live in a busy tourist town. I think it’s for cities. SPG and IHG have great looking (and working) iPhone apps by now. Hilton/ Hyatt and Marriott’s apps are a disgrace. I hope they can catch up one day!